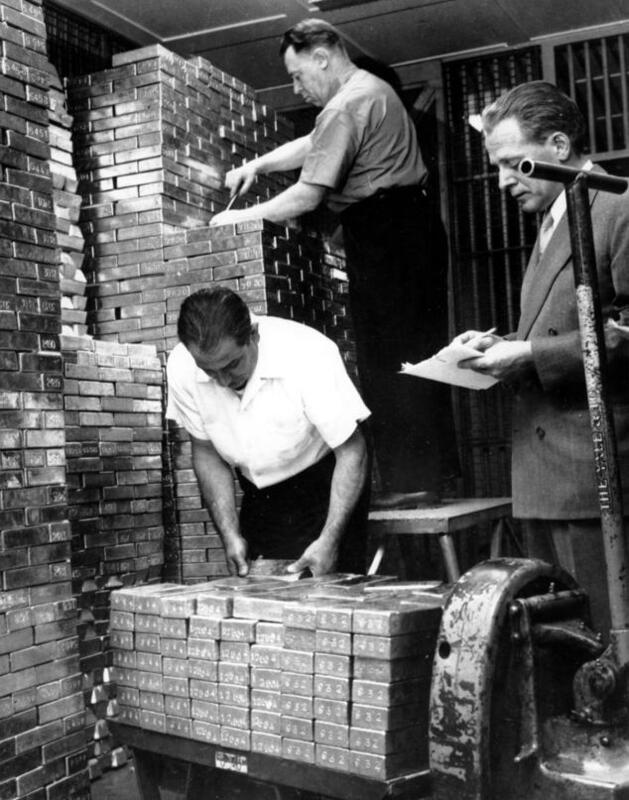 Fed Has 6,200 Tons of Gold in a Manhattan Basement—Or Does It? 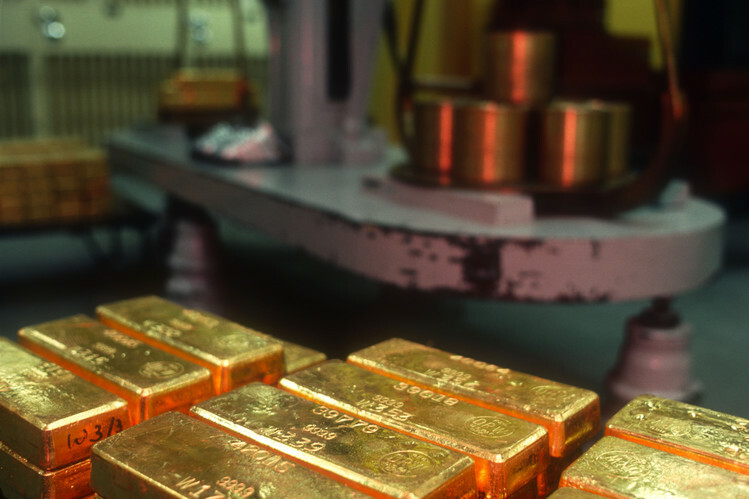 The Fed Has 6,200 Tons of Gold in a Manhattan Basement—Or Does It? The Fed tells visitors its basement vault holds the world’s biggest official gold stash and values it at $240 billion to $260 billion. Mr. Manly is among gold aficionados who wonder if the bank is hiding something about what it’s hiding. Other theorists suspect the gold beneath the New York Fed’s headquarters at 33 Liberty St. may be gold-plated fakes. Some conspiracy-minded investors think the Fed has been secretly leasing out the gold to manipulate prices. “There has to have been a central bank spewing their gold into the market,” said John Embry, an investment strategist for Sprott Asset Management in Toronto until 2014 who once managed its gold fund. “The gold price didn’t act right” during the time he was watching it and the likely explanation for the movement was Fed action, said Mr. Embry. The Fed has been selective in giving details about the contents of the vault and in the past has said it can’t comment on individual customer accounts due to confidentiality agreements. New York Fed President William Dudley told a March gathering in Queens, N.Y., that the fictional raid by drilling through from a subway tunnel in the 1995 movie “Die Hard With a Vengeance” was far-fetched. 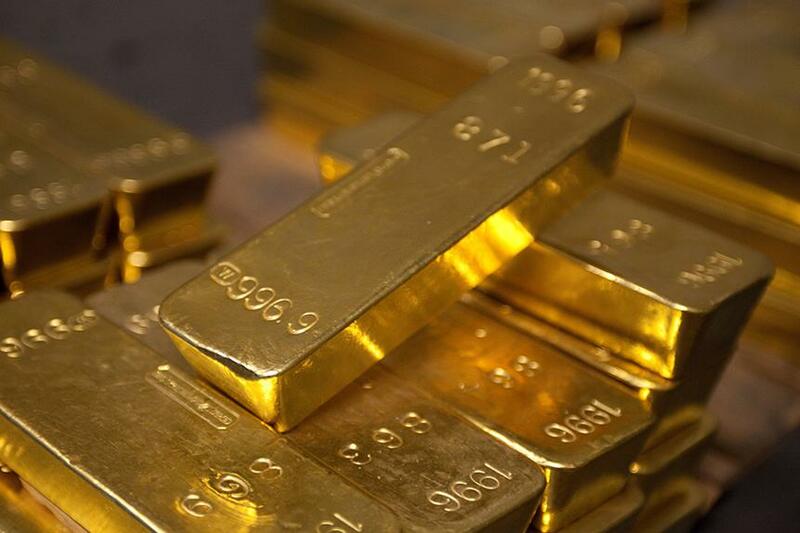 Along with the foreign gold, the Fed’s Manhattan vault holds about 5% of America’s roughly $11 billion in gold reserves and coin, valued at the statutory rate of $42.22 per fine troy ounce, according to the U.S. Mint. The U.S. government keeps the rest in Denver, Fort Knox, Ky., and West Point, N.Y. Elaborate theories build on what the Fed doesn’t say about goings-on in its vault’s 122 compartments. It doesn’t report when bars enter or leave and doesn’t let in outsiders—other than auditors and account holders—to count the bars or review records. Visitors on vault tours see only a display sample and can’t verify bars up close. Some gold bugs—investors bullish on the yellow metal—think the Fed secretly lends it out to suppress prices, partly to protect the dollar’s value. In theory, the Fed can feed gold into the market through swaps with other countries. Then there’s the purity question. 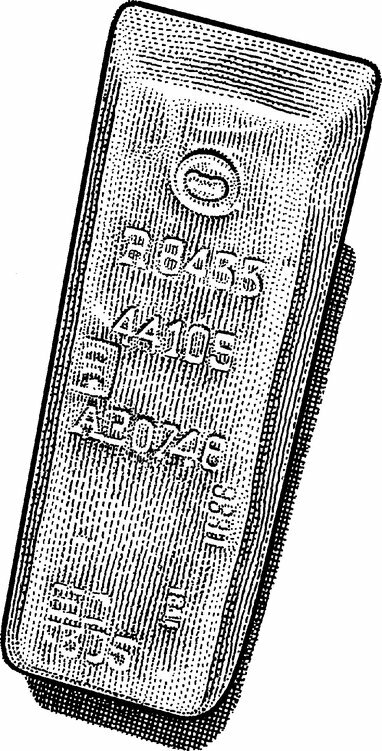 Mr. Turk said there are “questions in gold circles as to what’s in an actual bar.” One theory, he said: They could be gold-plated tungsten, which would weigh almost the same. 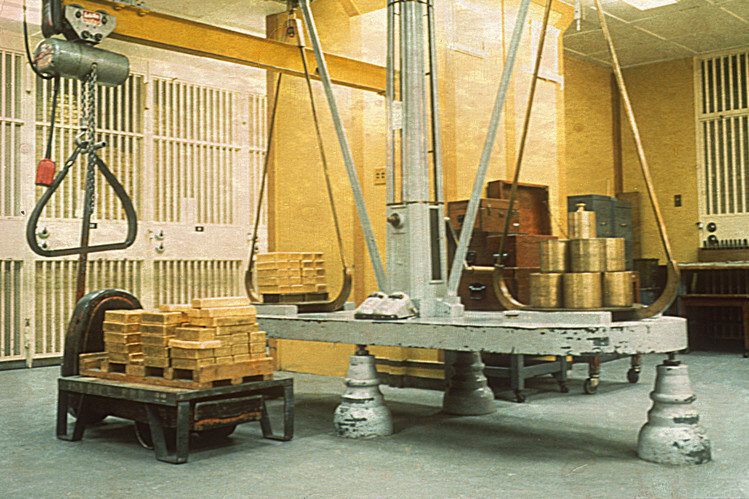 In a 2012 audit of U.S. gold at the Fed’s vault, the U.S. Mint and the Treasury’s Office of Inspector General sent 367 samples to an independent lab for testing. All but three samples came back within 0.13% of the purity recorded by the government, within standard industry tolerance, according to the Mint and Treasury. Since then, annual government audits of the Fed’s vault have inspected only the locks and joint seals on the compartments to check they haven’t been tampered with, a Mint spokesman said. New legislation, nicknamed the “Audit the Fed” bill, could allow the Government Accountability Office to audit the Fed’s vault, said a spokesman for the bill’s Senate sponsor, Rand Paul (R., Ky.). GAO lawyers wouldn’t speculate on the bill’s reach. Mr. Paul’s spokesman said the Senator has arranged a personal visit to Fort Knox this fall. Did Germany get any of its gold back? I do think Texas got theirs back. Texas? Do all the states have gold bars in NY? I heard they sent the Germans Bitcoins instead. Maybe they took the gold from Illinois to give to Texas? At this point in my life whether or not they have the gold they say they have is irrelevant. In a way I'm fortunate to watch this all go down and still sleep at night knowing my responsibilities have all been met down through the years. Just as Safe as the Gold at the US Gold Depository at Ft. Knox. Was in NY in 1976 as a teenager with a tour and got to visit the Fed vault. After walking past a thick window behind which workers were stuffing canvas bank bags with packs of $100 bills, we were taken to the vault entrance. The door consists of a BIG cylinder of steel with a door size opening cut through it, which sits in a BIG matching steel block with similar openings. To gain access, the cylinder is rotated so the openings align. Once inside I saw the gold bars sequestered in cages with doors, and labeled by country. At the time the section labeled "US" was stacked/packed nearly to the ceiling. Other countries' amounts varied widely, some had only a few pallets of bars while others had many times as much. It was very interesting. Is this the same gold that was supposed to be in Ft Knox? Good thing Bond stopped Goldfinger from irradiating it. *THAT* was a close call. Do they still give tours? Last I heard they received a portion (like 10-20%) but not all of it. There's was some lame excuse that it wasn't easily accessible due to identification problems or some such nonsense. FWIW - I've chased this 'Rabbit Hole' a few years back. My intent was to find out what happened to the gold at Fort Knox if it was relocated or held some place else. I don't have the exact figure but 8,000+ tons is supposedly what the U.S. gov't. has in it's holding as a grand total. During my search I found reports of a few hundred tons at various Mints across the U.S. with the exception of 2 being the N.Y. basement (2nd level) and West Point. Since West Point was established as the new mint for the Buffalo's (gold) and various other commemorative coins, etc. then their holdings would need to cover operation and thence some. No numbers were ever disclosed (or found) but perhaps they're out there somewhere online. The closest figures I could find on the N.Y. Reserve holdings, ahem, I mean the Gov't. holdings in care of the Reserve (cough, cough).........was about 4,000+ tons. That leaves the other 4,000 to be elsewhere. If we assume that West Point has a minimum of 2,000 tons then it's 4,000 N.Y. + 2,000 West Point + 2,000 various mints & lastly Ft. Knox. Again, it's a rabbit hole and there's a lot of missing information...........so just keep stacking. Don't kid yourself...your grandma has more gold than the US government.